WHAT IS COLD PRESSED DOG FOOD? Cold pressing is a unique process that means we prepare your dog’s food without the need for high temperatures, which can damage delicate vitamins and minerals. We use carefully selected ingredients, then gently mix them together before they are pressed at low temperatures for a few seconds to form nutritious, tasty nuggets. Canis is crafted the authentic cold pressed way. We create small batches, with the highest quality ingredients, chosen especially for your best friend. We don’t add any fillers or artificial nonsense to our food. We’re proud to be the 1st ever authentic Cold Pressed food that’s made right here in the UK! IS CANIS SUITABLE FOR ALL BREEDS AND ALL AGES? Yes, of course. Our food is cleverly balanced in a way that makes it suitable for all breeds/ages, from a Chihuahua to a Great Dane! We include 23 different ingredients, before adding supplements such as Glucosamine and Chondroitin which are great for your dog’s joints. We’ve also included Green Lipped Mussels, a natural wonder food only found off the coast of New Zealand, which is used to treat rheumatoid arthritis and osteoarthritis. For our smaller friends we have Canis small bites. These nuggets are especially shaped for smaller mouths and are made with the same great ingredients. HOW DO I TRANSITION TO CANIS? We have 2 feeding calculators (Puppy & Adult) to help make transitioning easy. Canis Cold Pressed breaks down in your dog’s tummy rather than swelling like extruded (regular) food, so transitioning times can vary. We recommend transitioning over a 7 day period. Start by mixing 25% Canis to your dog’s bowl with 75% of their old food for 2 or 3 days and see how they get on. As long as their stools are firm and they’re settled, gradually increase the amount of Canis throughout the remainder of the 7 day period. We suggest mixing Canis 50/50, then 75/25 until you’re 100% transitioned. Canis cold pressed breaks down in your dog’s stomach in a similar way to raw food. Transitioning shouldn’t take more than a few days, as you can start by feeding 50/50. Some raw feeders may prefer to continue to feed a combination of both Canis and raw. Just remember that raw contains about two thirds moisture, so adjust the feeding amounts accordingly. For most dogs, a transitioning period won’t be necessary. However, if your dog is used to a particular protein or has a sensitive tummy, you can mix the two foods together for a couple of days. Remember, if you need any help or advice transitioning your dog onto Canis, please contact us. HOW DO I STORE CANIS? To keep Canis at its best, we recommend storing the nuggets in their original packaging in a cool dry area. Please do not store Canis in an air-tight container, as Cold Pressed food needs to be able to breathe. WHEN CAN I MOVE FROM THE PUPPY CALCULATOR TO THE ADULT CALCULATOR? Place your dogs weight in the Adult calculator and gradually reduce the amount you feed over a 2 week period. If you’d like to discuss further, please contact the Canis Crew. MY DOG IS A FUSSY EATER, WHAT CAN I DO? If you’ve tried feeding your dog several varieties of food without success, then it’s time you switched to Canis Cold Pressed. Because of the quality ingredients and our unique low temperature cold pressing, each nugget retains more nutrients and flavour which even the fussiest of dogs find hard to resist. We recommend tempting your fussy eater with a Canis trial sample and watch them come back for more!  HOW IS CANIS COLD PRESSED DIFFERENT TO RAW AND EXTRUDED FOOD? Cold Pressed food is different to both regular dried dog food and raw. There are many different dry foods on the market. About 95% of dried food, known as kibble, is made using a high temperature method called extrusion. This method cooks the ingredients at very high temperatures which can degrade the proteins, vitamins and minerals. Once the food is cooked, it passes through a ‘coating’ machine that sprays fats and oils onto the kibble that were lost through the high temperature cooking process. Raw feeding (also known as BARF) uses a combination of uncooked proteins, carbohydrates and vegetables. This diet isn’t always convenient for dog owners as it can be quite time consuming and expensive. Canis Cold Pressed is the best of both worlds! The ingredients are dried and ground then mixed together before they are gently pressed at low temperatures for a few seconds. Our authentic cold pressing method allows us to create nutritious, tasty golden nuggets packed with goodness for your best friend without the need of high temperatures or time-consuming preparation. This makes Canis nutritious, delicious and super convenient. You can even mix the nuggets with water to form a delicious porridge to increase its moisture content. All of our proteins and carbohydrates are cooked to remove bacteria and ensure digestibility. MY DOG IS OVERWEIGHT, WHAT CAN I DO? We use a wide range of quality ingredients which are ideal for maintaining a healthy weight. 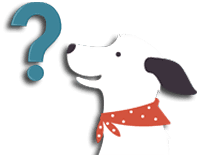 To find out how much to feed your dog simply go to the feeding guide page and locate our interactive calculator. Using the slider, select your dog’s ideal weight to see how much Canis to feed per day. For example, if your dog is 12kg but their ideal weight is 10kg, select 10kg in the calculator and feed the recommended daily amount (120g). If you wish to reduce your dog’s weight further, reduce feeding amounts to 1% of their ideal weight (100g). If you’re concerned about your dog’s weight, we would always recommend speaking to a veterinary professional. MY DOG IS A FAST EATER, WHAT CAN I DO? Perfect as a porridge – you can add hot water to Canis to make it into a porridge type consistency which helps slow down fast eaters. It’s also great as a special treat or if your dog is older and has difficulty chewing. Simply measure out the correct amount of Canis in a bowl then pour hot (not boiling) water onto the nuggets, adding just enough to cover them. Stir, allow to cool for 5 to 10 minutes before feeding. Slow feeder bowls – these are a great idea to slow down fast eaters. You can also hide some of the nuggets in chew toys so they will have to work for their food. This will also help keep them mentally stimulated. Cold Pressing uses much lower temperatures and less energy than canning and extrusion. Not only is Canis made right here in the UK, we also source as much UK produce as possible, which lowers our carbon footprint and helps sustain jobs. WILL CANIS HAVE ANY SPECIAL OFFERS AVAILABLE? From time to time we do offer special promotions on our food. Check out our Shop page for current offers. © 2019 Canis & Co. All rights reserved.